Through all the work we do – consulting, training, and blogging – we want to help demystify digital marketing and empower teams to do make efficient strategy decisions so they can spend time promoting good in the world. Our community outreach efforts range from give-back days, fundraising, and perhaps our favorite – sharing information with local organizations and nonprofits about our specialty areas. Learn how a few quick-hitting digital marketing wins could set up your organization for similar success. A few weeks ago, we invited 412FoodRescue to our offices for a half-day digital training session. We shared information about SEO, Paid Search and Google Analytics. Our goal was to equip the nonprofit team with best practices and provide quick wins to support their ever-expanding mission. 412FoodRescue is a 3-year old start-up that began–as the name suggests–in the “412”: Pittsburgh, PA.
Their business model is simple, yet so effective. They partner with local businesses like grocery stores and restaurants to “rescue” surplus food that’s about to go to waste. When they identify an over-abundance of food, they leverage their network of 1,300+ local volunteers to complete same-day deliveries. This is coordinated through their app where volunteers receive real-time notifications when there’s a local delivery in their area. Think of it as Uber for browning bananas! Since 2015, 412FoodRescue’s volunteers have rescued 3.3 million pounds of food, generating 2.8 million meals. Their app is gaining national attention and they’re looking to roll out their business model to other cities. Some of our employees are food rescue-ers, so it became a cause we wanted to contribute to digitally. If you’re in the Pittsburgh area, you can sign up for their volunteer opportunities, too. We began the day with SEO, sharing tips for writing unique, tightly focused title tags, meta descriptions and H1s. The goal of these fields is to reflect a page’s theme. With a little keyword research, we work-shopped writing title tags and meta descriptions for a few of their key pages. Their site scored a 70/100 on our 13 question, “Mini SEO Checklist”, which is a great score, so we spent time improving their on-page tags instead of delving into advanced technical items. After using Google’s Keyword Planner, The “Volunteer” page changed to “Volunteer Opportunities” and the meta description was refreshed to include a stronger call to action. When we took a look at Google Search Console, we saw their CSA program–lovingly dubbed, “Ugly CSA”–actually had search demand. We added “in Pittsburgh” to help the title be more locally relevant. It’s these small changes that can make a huge difference to a nonprofit site. Especially when there’s a critical need to be focused locally. As a next step, the team plans to update metadata for their top 15 pages and think of future content opportunities as they conduct keyword research. Does your business have a few key pages that could benefit from a little keyword research and some data analysis? Start small by taking cues from Google Search Console and optimizing pages by incorporating the keywords that users are already typing in to get to your pages. Next up was paid search. The team was curious to learn about creating better campaigns. Their agency had set up a Google AdWords Express account a few months ago, but we encouraged them to change their account to a “typical” Google Ads account and to sign up for a Google Grants account for additional bidding options, better management tools, and more detailed insights. With a monthly Grants budget of $10,000, we found they could amplify their coverage by expanding their campaigns, defining important goals, choosing audience targeting and experimenting with ad formats. Having this capability will significantly change the way 412FoodRescue communicates with Pittsburghers via advertising. Together, we outlined a search campaign designed to encourage people in the Pittsburgh area to volunteer. We chose keywords, wrote ad copy and decided on the best targeting to get their ads in front of the right people. The team was also excited to learn about remarketing opportunities that would allow them to communicate a different message to people who had already been to their site and had shown interest in their app. This option will be a quick win, especially in the volunteering space. To complete the paid search portion of the training, we provided a template report in Data Studio to help 412 Food Rescue quickly analyze their Google Ads data to facilitate future marketing and advertising decisions. Take a minute to think about what relevant ad copy might look like for your users. Are you trying to rally an army of volunteers or drum up additional donations? Crafting ad copy to speak to each group of users and applying the targeting options in Google Ads can ensure you’re delivering appropriate advertising. We closed the day with an overview of Google Analytics. We saved the most complicated, most detailed project for last. The goal here was to really empower the team on where to begin with their overall analytics strategy and what resources are available to learn more about GA. We provided them with a customized list of “homework” items to help plan out their overall analytics solution and links to great resources to learn how to accomplish those tasks. We started with a discussion of 412FoodRescue’s business objectives and how to define them. Their goals revolve around engagement, user interactions, and downloading the app to become a Food Rescuer. To plan out your own strategy, check out Sam’s amazing post A Simple Start to a Powerful Analytics Strategy. From there we went into the importance of a solid foundation and taking advantage of everything there is to offer out of the box within GA. We provided some recommendation of things to enable and update before starting to implement more customized features. For example, filtering out extra query parameter and setting up site search. The true power of analytics comes from customization, your needs are different from the needs of the person next door; it’s impossible for Google to make an all-encompassing solution. Events and custom dimensions are the easiest tools to unlock more in-depth insights for your site or app. We walked through the site and talked about important event to start tracking now, such as clicks on download the app. Finally, we ran through the Google Analytics interface together – answering reporting questions, showing the team our go-to reports, and making quick easy updates to their settings. One quick change we made was setting up a test view or making updates to filters. Digital marketing can be overwhelming, but it can be approachable! The first step, like learning any new skill, is making it a priority. Setting aside time for keyword research and analyzing your existing site data can help you focus your marketing efforts and make sure you’re maximizing your limited resources. Even a few hours can make a big impact. This is especially true for smaller organizations like nonprofits where time is valuable and resources are scarce. Our advice is to start small and scale what works. Conduct keyword research for each page to determine a priority term. Write an optimized title tag and meta description centered around that term. Ensure you’re using your full character limit and include a descriptive, compelling call-to-action. Think about how your audiences might search, from volunteers to donors for those researching about your mission. Learn how to write effective title tags. Write compelling ad copy for target audiences. Use compelling call-to-action verbs to active your audience. Terms like “Volunteer,” “Donate,” “Learn,” or “Help” can speak to the specific audiences you’re targeting. For ideas, view our call-to-action cheat sheet. Define and implement event tracking. The standard metrics that come with an analytics install are great, but to get in-depth knowledge of your users implement customizations like events. Check out our event naming post to understand best practices for event tracking. Apply for a Google Ad Grant. If you are an eligible nonprofit, a Google Grant can go a long way in helping create awareness for your cause. Our team here at Lunametrics–Kristina, Megan and Jayna–so enjoyed our morning with 412FoodRescue. Our one regret is that the day ended too soon! We could have brainstormed for another couple hours. Leah, Sara and Becca are a team of tenacious learners with a passion to end food insecurity in Pittsburgh and we’re happy that we could be a small part of 412FoodRescue’s digital journey. We can’t wait to see what they’ll dream up next! Local to Pittsburgh? Learn more about 412FoodRescue and join their mission to end food insecurity in our communities and neighborhoods. 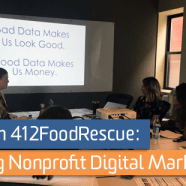 The post A Day with 412FoodRescue: Tips for Managing Nonprofit Digital Marketing appeared first on LunaMetrics.